My family and I take a lot of road trips, but we don’t dread being stuck in a car together for hours and hours. We actually love road trips because we are very well organized, and equip ourselves with a variety of entertainment and activities. We weren’t always this way, of course. Our first road trip as parents was quite the disaster, with too long of a ride and one very cranky baby. That first miserable trip, and every trip since then, has helped us create a great system for keeping the kids entertained in the car. BOOKS, BOOKS & MORE BOOKS The children are allowed to bring any book, magazine, or other reading material they want. They are also able to access their digital library through their e-readers and tablets. These books are interactive with educational websites that we usually use at home. The books are either on their reading level or one level above to keep them challenged and focused. We can usually hear them in the back seat, answering questions, reading aloud, and even practicing skills and concepts that serve as a review or preparation for the school year ahead. They don’t necessarily consider it a learning experience, but Mami does! ELECTRONIC GAMES The boys love their DSI’s (Destination Software, Inc) When I know we have a long trip planned, I make sure that the day before we leave, my boys don’t play with any electronics. We are outdoors or on an adventure in our community. Because of this brief hiatus from their gadgets, they aren’t bored easily with their toys and the novelty lasts a little longer in the car the next day. And while many parents dislike electronic games, we enjoy that our kids play against (and with!) each other and they are very interactive with the games. Sometimes they even foster conversations about teamwork and achieving goals. FAMILY GAMES My youngest child is practicing his alphabet and numbers so the entire family gets involved, especially on these road trips. I may shout out a letter and tell everyone to name five things (a fruit, sport, food, or object, for example) that begins with that letter. Then, the person who gets all five right gets a prize. What prize, you ask? I make sure to pack a bag of small goodies that the boys have never seen. New toys, even cheapies from the dollar store, are always a hit! We also play, “I Spy” as a family, during which we have a lot of fun while encouraging the boys to stay focused on a task, pay close attention to details, and try to figure out what that one person spies with their little eyes. With these three forms of entertainment and the many others we come up with along the way, before we know it we have arrived at our destination. 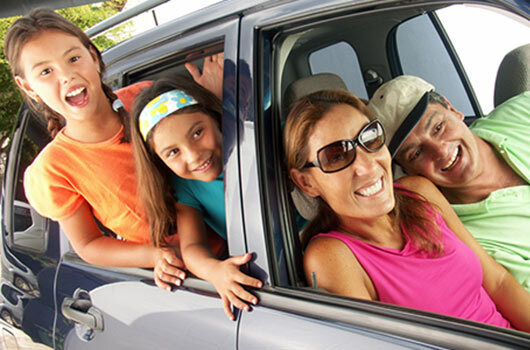 Our strategies for road trips allow us to interact as a family and really enjoy the quality time with one another. In fact, in January when we were forced to take a six hour drive to Boston, our oldest said, “Wow Mami, that trip was fast!”…six hours flew by. Road trips are no longer a disaster for our family, but more like an adventure we genuinely look forward to!